Kaiser, M.D.A.I.K. 46, 1990 p. 296 (cf. seal impression from Abydos U-210, Hartung: MDAIK 54, 1998, 200f., nr.22). S. Hendrickx, Bovines in Egyptian Predynastic and Early Dynastic Iconography, in: F. Hassan (ed. ), Drought, Food and Culture..., 2002, 275-318. "Er ist ein Liebling der Frauen" (P. Kaplony) Ägypten und Levante 13, 2003, 107-126 (esp. 119f.). [The color photo of the Gerzeh palette above has been kindly provided by Juan de la Torre and Teresa Soria © EGIPTOMANIA.COM ]. - The tomb contained R-ware type 66A (SD 42-77) and 76P (SD 47-78) [cf. Tomb-cards on microfiches/ CD-rom]. - Roughly similar palettes shapes (Petrie, Predyn. Corpus, type 87) are known from Tarkhan (SD 77) although it can be fairly believed that simple geometrical shapes must have had a longer development. 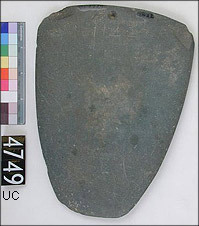 Palette Pred.Corpus type 86 is known from Tarkhan (SD 78) as well as from Naqada 1255 (Ashmolean Mus. 1895.834) dated to Naqada II (J. Crowfoot-Payne, Catalogue, 1993, 226, cat. nr. 1858). Type 87B is SD 58-69. Even more similar to the Gerzeh t. 59 Hathor/Bat palette, is the shape of Predyn.Corpus type 87H (yet less rounded at the top) known from Tarkhan t. 973 (SD 77) and from Naqada tomb 1422 (= palette in London, UC 4749, see figure on the right >) which is however hard to date, due to lack of pottery known from it; cf. Baumgartel, 1970, pl. 42). - The Gerzeh palette relief seems to belong to the same decorative trend as the British Museum 35501 "Min-palette" from el-Amrah tomb B62 (dated with good reliability to Naqada IId1: cf. Crowfoot-Payne, Catalog, p. 287). The palette might also be older than the other objects in Gerzeh tomb 59, though hardly earlier than Naqada IIC. 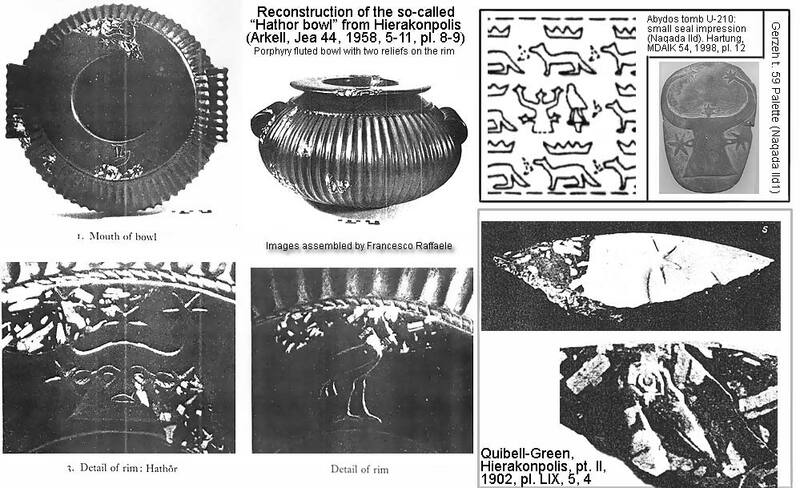 - S. Hendrickx and R. Friedman seem to prefer a date for the Gerzeh palette (and tomb 59) "more likely towards the end rather than the beginning of this [i.e. Naqada IIC-IIIC1] time period", in GM 196, 2003, 96, n.1. Anyway Hendrickx has informed me that the statement above was erroneously inverted: the probable date is Naqada IID2 in his opinion (pers. comm. ; cf. id., Visual representation and state development in Egypt, i.p., 2008, n. 23). 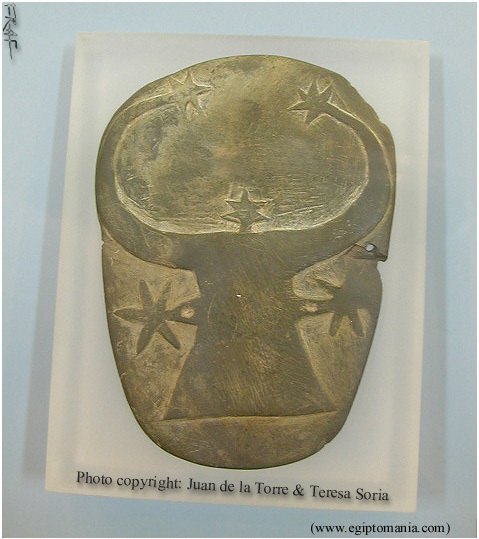 For the "Hathor/Bat" motif on other objects see the references in the image below and above all: S. Hendrickx, op. cit. 2002, p. 310, Appendix H.
It has been recently found incised on a P-ware bowl sherd (more correctly an ostracon, for the incised on both its faces seem to have been scratched after the jar was broken) from Hierakonpolis loc. HK 29A in a context which is hard to precisely date, but probably late Naqada II or early Naqada III (cf. Hendrickx, Friedman, in: GM 196, 2003, 95ff., and fig. 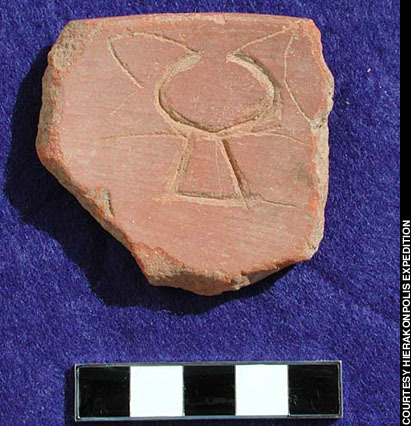 2; S. Hendrickx, R. Friedman, Chaos and order: A predynastic "Ostracon" from HK29A, in: Nekhen News 15, 2003, 8-9; photo of one side of the ostrakon: Web-Link). 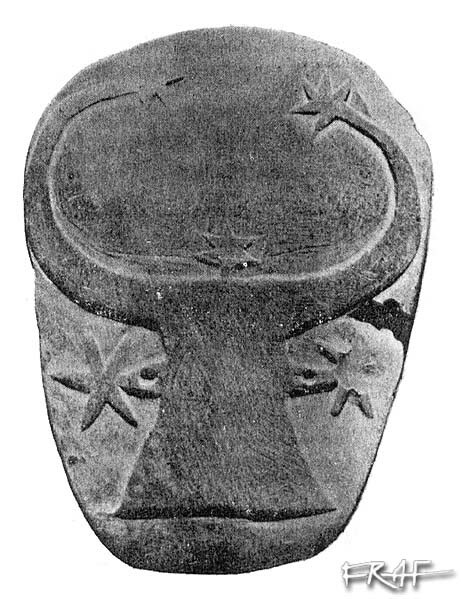 Also see the potmark in B. Adams, Predynastic Egypt, 1988, 50, fig. 30 i (from Naqada) for a similar bovine-motif. The Saddle Bill or Jabiru stork (Ephippiorinchus senegalensis) is also known on decorated knife handles and other carved objects (Abu Zeidan t. 32/Brooklyn Knife handle; Carnarvon Handle (flat side, line 1); Davis comb (line 2, both sides); Seyala mace-handle... See them all here: GALLERY 7.1. Early in the 1st Dynasty it appears represented on a label of Djer, perching on the tail of the Nar-fish-god (mummy or statue) carried in a procession.